M2-ATX-HV is an intelligent, high power, vehicle (car / boat / electric cart) 12V DC-DC ATX PC power supply designed for car pc and battery powered applications. Designed to provide power and to control the ON/OFF switch of a motherboard (car PC) based on ignition status, M2-ATX-HV is a wide input (6 to 32V) vehicle / car / battery operated ATX power supply capable of surviving tough car engine cranks (down to 6V) as well as transient over-voltage situations. Just connect it to your car / boat / RV / solar battery and power up your PC! M2-ATX-HV has 8 user selectable microcontroller driven timing modes, allowing you to choose up to 8 ignition/shutdown car pc timing schemes via a built-in shutdown controller. 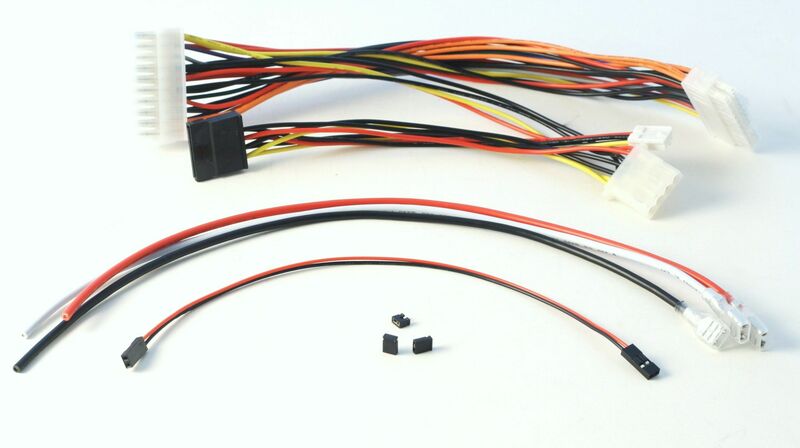 By removing all user-selectable jumpers, M2-ATX-HV becomes a traditional PC PSU with no ignition control (shudown controller bypassed) and it can be used in non-vehicle computer applications. Even if your computer is totally OFF, a PC will still consume a few hundered milliwatts, needed to monitor PC ON/OFF status. When the computer (car pc) is in the suspend/sleep mode, it will consume even more power, because the RAM needs to be powered at all times. The power consumption in the suspend mode is few watts. No matter how big your car battery is, it will eventually drain your vehicle / car battery in a matter of days. While in deep sleep mode, M2-ATX-HV constantly monitors your car battery voltage levels, preventing deep discharge situations by automatically shutting down (using a built-in shutdown controller) until battery levels reach safe levels again. No more dead car batteries, no more computer resets during engine cranks, along with multiple timing schemes, small formfactor and very competitive price makes the M2-ATX-HV the premier solution for dc-dc ATX vehicle / car PC power supply solutions. M2-ATX-HV is formfactor compatible with VoomPC-2 car PC enclosure and with most Casetronics and Morex enclosures and it is footprint compatible with the M1-ATX. The same version of microcode will run on both M1-ATX and M2-ATX. NOTE: M2-ATX-HV provides up to 8A on the 12V rail, making it ideal for operating most Core 2 duo, Celeron, AMD systems. Low power Geode and VIA processors (C3, C7) will work as well, leaving ample power for 12V or 5V peripherials (multiple 3.5" hard drives, CDROM, etc). Other timing schemes / designs are possible. OEM / reseller integration is welcome. Please send en email to with your custom requirements. - Connect Automotive PSUs with AC Adapters. - Works with M2-ATX, M3-ATX and their HV counterparts.